You have surely come across many Chandler process servers in case you are considering hiring one of them. There is no denying the fact that there are many efficient process servers in the city. However, unfortunately, there are some process servers in this region who lack the necessary knowledge and skill to help you with the delivery of your important legal documents. You can not really afford to rely on a wrong person with materials that are both time sensitive and legally binding. Price is another factor that may play a vital role in your decision making process. Always try to ensure that you are receiving the best value for the money that you spend. Too much focus on cost can be dangerous because you may end up spending much more at a later stage. Consider the points mentioned below during the hiring process to make sure that you are opting for the best process servers in Chandler. It is surprising to know that many process servers in this region hold on to their fees even after failing to deliver the documents due to a change of address. 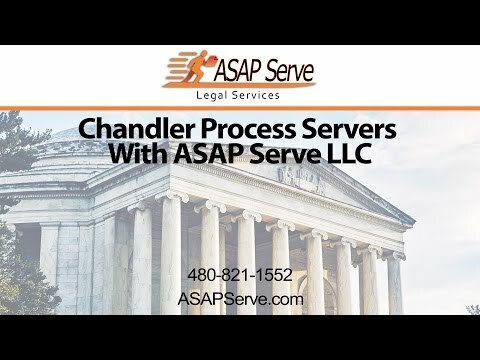 Therefore, conduct a research on all available Chandler process servers to find out their reputation in this region. Use of proper technology is another point to consider. The best of the process servers in the city use latest technologies like advanced documentation software, surveillance equipment, global positioning technology, etc. Avoid hiring process servers that are not equipped with these latest technologies. Insurance and license are two of the most important things to look for in a process server. There are serious risks involved in dealing with process servers without these mandatory requirements. A good process server must be persistent about getting in touch with their target. This is an important quality because people are getting busier by the day, and are often not found in places where they are supposed to be found. Similarly, quick thinking and calmness are two highly essential traits of a successful process server. Quick thinking helps them in proper execution of plans within a short notice and calmness is essential to handle tight situations without getting emotional. Successful process servers must also have access to updated information pertaining to their target, and tools to collect more information whenever required. Thorough knowledge of the legal process in the state and the target industry is also something to look for while appointing a process server. Finally, check the customer service policy of the service provider because improper service can seriously hurt your reputation.